When the establishing of "Suguyaru Ka: Do-it-now Section" became news several years ago, citizens were dissatisfied with the service by city hall or town hall employees. The issues which citizens asked for have come to be solved quickly since the "Do-it-now Section" was established, I suppose. By the way, I wash the dishes as soon as we finish meals especially during summer. It is the housework version of the "Do-it-now Section". Nobody in my family complains even if I do not finish the housework, but I myself am comfortable when I quickly finish the housework. Now, the well-water at home is very, very cold. Even the water tap is cold as if it is freezing. 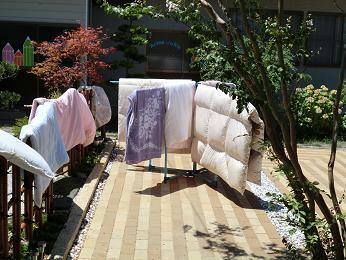 I dry things including futon, Japanese cushions, slippers, shoes and so on outside under the flaming sun. After that I do housework inside using cold water. What a happy summer life I am spending!